Conversions or redesigns always involve balancing the extent to which the old building fabric can be preserved against the creation of a form in which the qualities of a contemporary way of living can be implemented. Najjar & Najjar Architekten layered the House B anew both inside and outside – in the truest sense of the term – and, using a tripartite construction of columns, placed a new roof level on top of it. With views on all sides. Since the 18th century villas have been erected on the hills of the Vienna Basin, the eastern foothills of the Northern Alps, directly on Vienna’s municipal border. The existing house, which dated from the 1960s, was located amidst these heterogeneous residential surroundings. 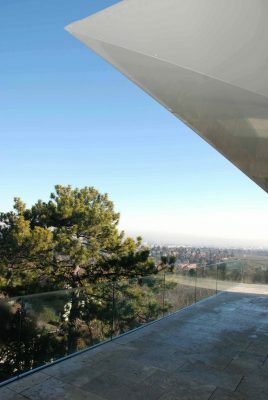 In redesigning this house on a slope the view played the principal role. The original building had little of the character of a villa; having been adapted and extended several times it hardly possessed any real architectural or spatial quality. In particular, due to the condition of the building fabric and the somewhat oversized volume, the most recent roof top addition was not deemed worthy of preservation. 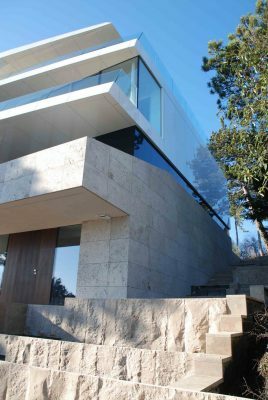 Najjar & Najjar Architekten, who are known for their innovative – and complex – solutions, revealed the “personality” of this house and designed a contemporary villa that derives its life above all from the way in which it is differentiated. 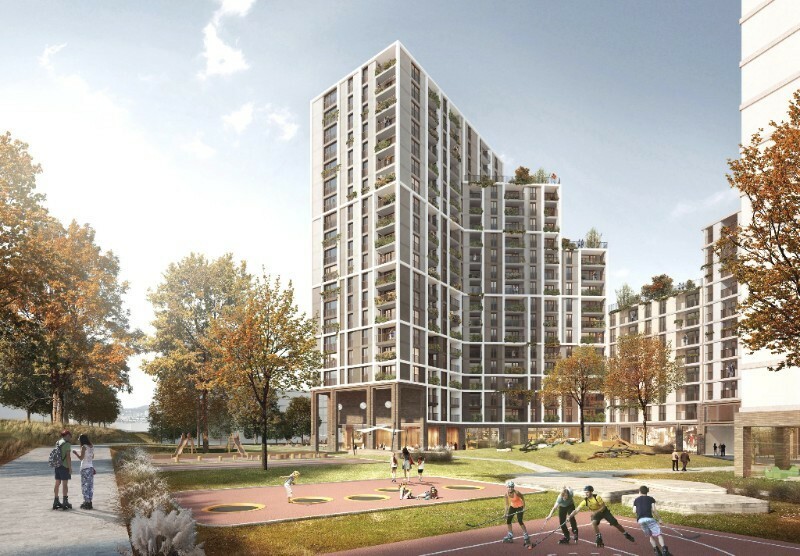 Already as you approach the facade the different living areas are clearly legible – along with the special ambivalence between privacy and a complete view of the distance. Materiality, transparence and a game played with forms are built up in layers. 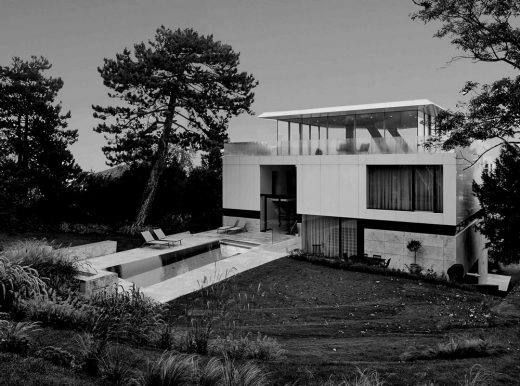 Rames Najjar: “We wanted to restructure the relatively large house and the verticality of the existing block. 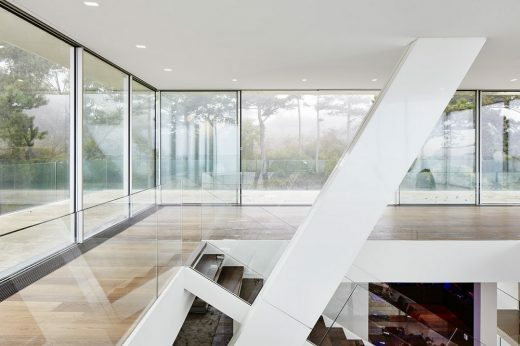 The plinth zone is emphasized by the natural stone; the house becomes increasingly transparent as it rises upwards.” The sleeping area – legible as a tinted band of glazing – separates the ground floor from the living area positioned on top. The roof level was completely redesigned. Structurally supported by three columns, the new construction allows a wrap-around glass facade and a 360 degree view from the top level. In clear weather this is truly impressive: you can see the valley of the River Wien in the north-east, the Alpine foreland in the south, while looking east the view extends as far as the border to Hungary and Slovenia. 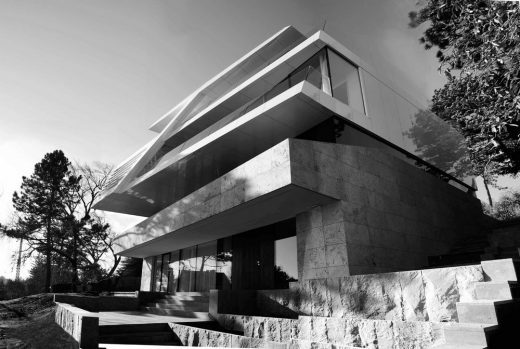 The villa faces east-west and stands on a relatively narrow and steep site that is accessed by two approach roads. The existing, central entrance on the lower floor has been retained. The plinth zone is the more private and the most shielded area of the house. Consequently the bedrooms, bathrooms and wellness rooms are located here at ground and first floor level. Thanks to the location on a slope and the optimized circulation from here you can directly access the terrace on the west side – and the pool. 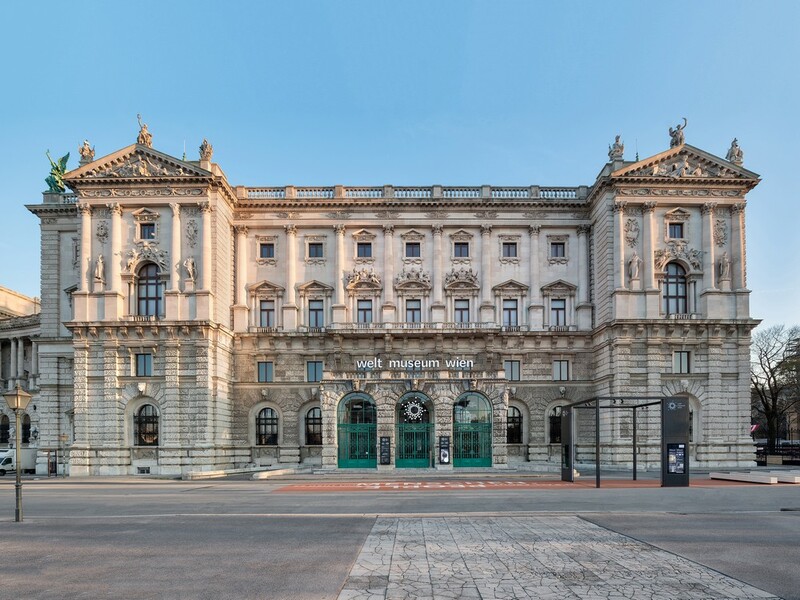 On this façade the openings in the original building were retained. On top, to the east, a building element was added at second floor level. This projection emphasizes the living floor as “a house on the house”. 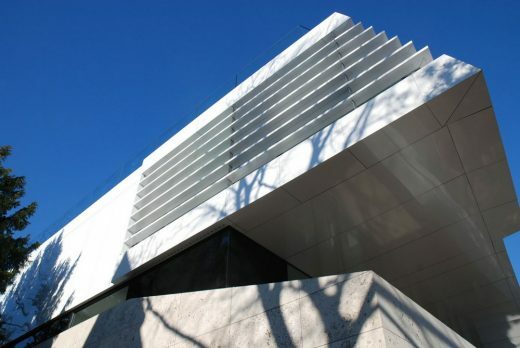 The white Alucobond facade strengthens the impression of lightness. 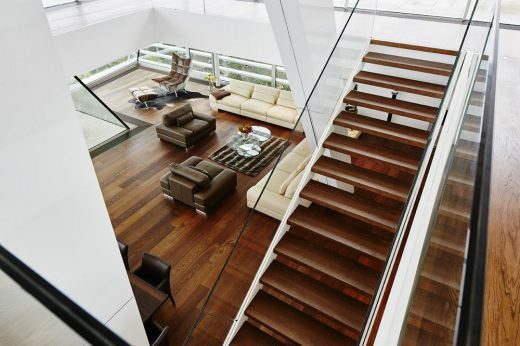 The space in the interior is large and bright – an open flight of stairs leads up to the top level, a glass pavilion that sits on top of the house. The spaces are flowingly connected with each other. The sloping structure of columns underlines the character of a modernized loft. As a whole the villa on the slope has left the 1960s behind it and, with utter self-confidence, has arrived in the 21st century. Umbauten bedeuten immer ein Abwägen, inwieweit die alte Bausubstanz erhalten werden kann und in welcher Form die Qualitäten eines zeitgenössischen Wohnens implementierbar sind. Najjar & Najjar Architekten schichteten das Haus B innen wie außen – im wahrsten Sinn – neu und setzten mit einer dreiteiligen Stützenkonstruktion ein neues Dachgeschoss oben auf. Mit Rundum-Panoramablick. Auf den Hügeln des Wiener Beckens, den östlichen Ausläufern der Nordalpen, direkt an der Stadtgrenze Wiens, wurden seit dem 18. Jahrhundert kontinuierlich Villen gebaut. 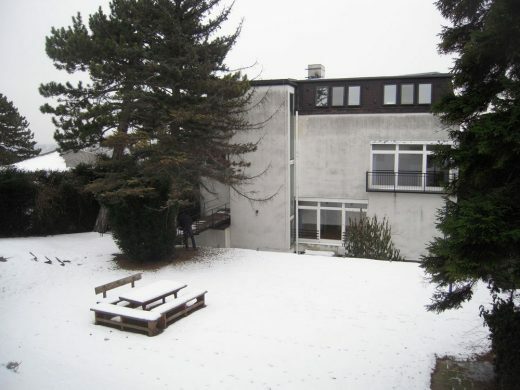 Mitten in diesem heterogenen Wohnumfeld fand sich das bestehende Haus aus den 1960er-Jahren. Beim Umbau dieses Hauses am Hang spielte der Ausblick die Hauptrolle. Das ursprüngliche Gebäude mit wenig Villencharakter, oftmals umgebaut und erweitert, wies wenig architektonische oder räumliche Qualität auf. Besonders der jüngste Dachaufbau war von der Bausubstanz und als etwas überdimensioniertes Volumen nicht erhaltungswürdig. 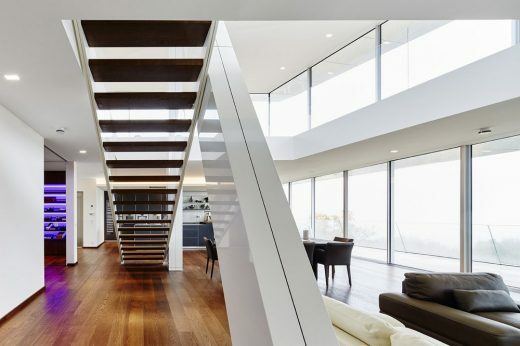 Najjar & Najjar Architekten, bekannt für innovative – und durchaus komplexe – Lösungen, legten die „Persönlichkeit“ des Hauses frei und gestalteten eine zeitgenössische Villa, die vor allem von ihrer Differenzierung lebt. Schon an der Fassade kann man unterschiedliche Wohnbereiche – und die besondere Ambivalenz zwischen Privatheit und totalem Fernblick – ablesen. Materialität, Transparenz und Formenspiel werden in Schichten aufgebaut. Rames Najjar: „Wir wollten das relativ große Haus und die Vertikalität des bestehenden Blocks neu strukturieren. Die Sockelzone wird durch den Naturstein betont, nach oben wird das Haus immer transparenter.“ So trennt der Schlafbereich – als getöntes Glasband ablesbar – das Erdgeschoss vom oben aufgesetzten Wohnbereich. Das Dachgeschoss wurde vollkommen neu gestaltet. Statisch von drei Stützen gehalten, ermöglicht die neue Konstruktion eine Rundum-Glasfassade und den 360-Grad-Blick von der obersten Ebene. Dieser ist bei klarem Wetter wirklich beeindruckend: das Wiental im Nordosten, im Süden das Alpenvorland, und im Osten kann man bis ans Grenzland von Ungarn und Slowenien sehen. Die Villa ist Ost-West ausgerichtet und steht auf einem relativ schmalen und steilen Grundstück, das von zwei Zugangsstraßen erschlossen wird. Der bestehende, zentrale Eingang wird im Untergeschoss erhalten. Die Sockelzone ist der privatere und der uneinsichtigste Bereich des Hauses. Deswegen finden sich hier im Erdgeschoss und im ersten Obergeschoss die Schlaf-, Bad- und Wellnessräume. Durch die Hanglage und die optimierte Erschließung erreicht man von dort direkt die Terrasse auf der Westseite – und den Pool. Die Öffnungen des Bestandes werden an dieser Fassade erhalten. Obenauf wurde östlich im zweiten Obergeschoss ein Bauteil hinzugefügt. 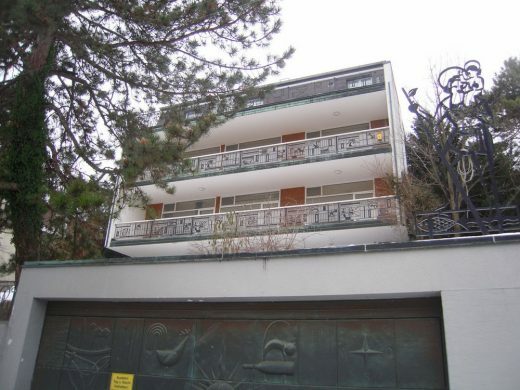 Diese Auskragung betont das Wohngeschoss als „Haus auf dem Haus“. Auch die weiße Aluminium Fassade verstärkt die Wirkung der Leichtigkeit. Im Inneren wird der Raum groß und hell – eine offene Treppe führt in das letzte Geschoss, das wie ein Glaspavillon auf dem Haus thront. Die Räume sind fließend miteinander verbunden. Die „schräge“ Stützenkonstruktion verstärkt den Charakter eines modernisierten Lofts. Insgesamt hat die Villa am Hang die 1960er-Jahre hinter sich gelassen und ist selbstbewusst im 21. Jahrhundert angekommen.